As much as Sam Adams co-founder Sam Koch apparently loathes the current craft beer scene, he seems to have tried to appeal to that demographic in recent years. Sam Adams "Rebel" series was an attempt to stray away from the standard Sam Adams lineup and it was met with mixed reviews. In the present day, Sam Adams has begun to experiment with Nitro beers. A nitro offering basically replaces CO2 with nitrogen to give the beer a creamier body. I'm sure most of you have had Guinness on draft, so you know what I mean. 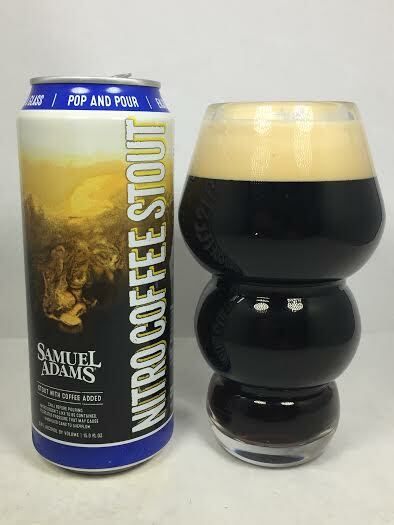 There are three beers to the Sam Adams Nitro Project: Nitro IPA, Nitro White Ale, and Nitro Coffee Stout. I think for starters, we will begin with the style that is subject to the nitro process the most: the stout. Tons of roasted malts on the aroma with a nice helping of bitter, dark coffee. Some nice dark chocolate and black coffee makes this more of a bitter-tasting experience rather than a straight-up coffee stout. Still, a nice mocha flavor is present as is some cocoa powder and even just the slightest hint of cherry and dark fruits. The aftertaste has elements of ice coffee, but I'd say it more like the bottom of a cup of iced coffee after it has sat out and is mixed with the melting ice cubes. As far as mouthfeel, I mean, obviously the nitro has made this incredibly creamy and smooth. As far as being a standard stout, the body is perfectly full. Overall, Nitro Coffee Stout is a basic coffee stout and nothing more. The "novelty" of making this a nitro stout did make the mouthfeel pleasant and soft, so I can't argue with the end result. It's by no means a game changer, but is still a smooth coffee stout and exactly what you expect when you buy it.